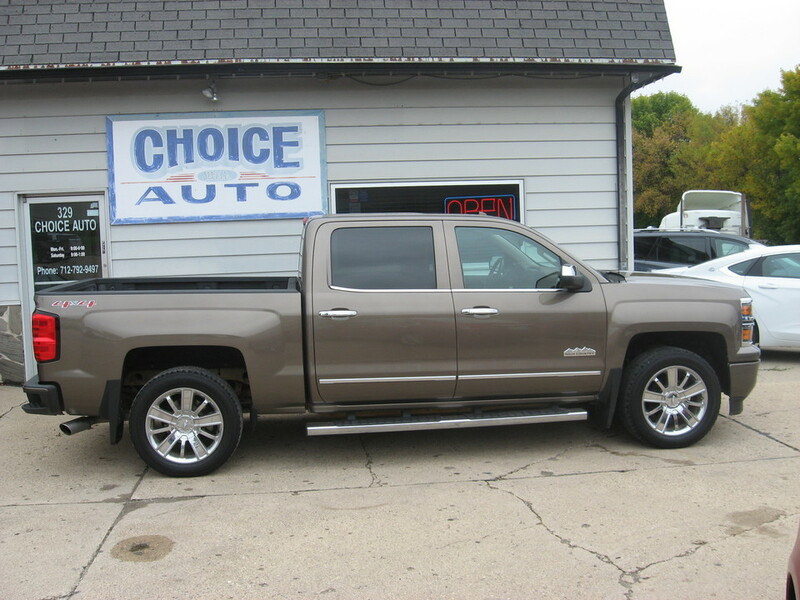 Nice 2015 Chevy Silverado Crew Cab High Country 4WD * 1 Owner * Buy used and save... Priced thousands under book * LOADED!!! NAV * Bose * XM radio * Premium heated/cooled leather seats * Heated steering wheel * Driver alert package * Hands free phone * Keyless entry with factory remote start * Weather tech mats * Trailer brakes * Tow package * Running boards * Bedliner * Mudguards * Rear sliding window * Backup camera * Nice color combination * Come check out today!!! At Choice Auto all our vehicles are inspected and if repairs are needed they are done to bring it up to our high standards. We promise no pressure selling and with the lowest overhead in the industry we are able to offer the best quality vehicle at the lowest possible prices. We are always looking for good trade-in's and offer Low rate financing * Carfax Reports * Service Contracts * GAP Insurance For more information on this vehicle and many more you can go to our website www.choiceauto.biz or call Rock (712) 210-4414 (Cell) or (712) 792-9497 (Office). THANKS FOR LOOKING! !